Let me just start out by saying that I do not consider myself a Christian, nor do I subscribe to any religion or religious organization. I consider myself "Spiritual" rather than religious. In my opinion, "religion" is the belief in someone else's experiences, and "spirituality" is the belief in one's own direct experience. Experience trumps faith. "The bottom line is: If you're a Christian, with OBEs, you don't need to merely pray to, or worship Jesus Christ, you can actually meet the man face to face. Is there precedence for that? Absolutely. Some people, myself included, have gone out-of-body and stood in the presence of Jesus Christ." So he asked me: "I'm interested to know where in the astral it was? And what he said to you." "When I went to bed, I was wide awake and couldn't sleep at first. At home, I was lying on my right side on the waterbed. For no particular reason, I started thinking about Jesus Christ and God, and wondering about Christ's relationship to God. It was probably because I had started reading a book that deals with this topic. As I was lying there immobile, I started focusing my mind in OBE fashion, but instead of visualizing an ordinary image, I held the image of Christ in my mind, plus an icon that I used to represent God. 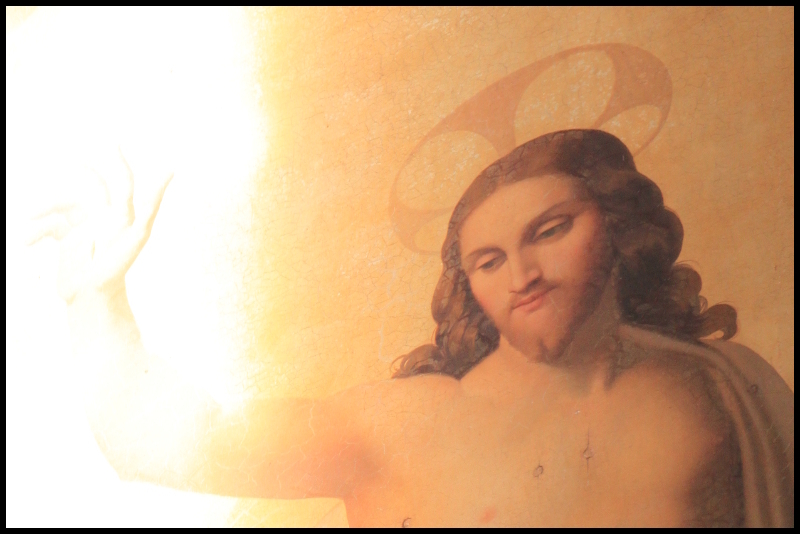 The image of Christ was on the left side of my visual field, and the icon of God was on the right side. As my mind focused into the OBE state, I had the passing thought, “No, Jesus should be at the right hand of the Father.” Then I realized that “right” and “left” are relative to “forward” and “backward,” and since I believed that God was everywhere, comprising all that is, God didn't have a forward or backward. I decided it didn't matter if Christ was to the left or right of my icon of God." "As I pulled myself down into the OBE state, my image of Christ seemed to become very real, and so did the icon or idea of God. It seemed as if I actually felt the presence of Jesus Christ, and through Jesus, a connection with God. Now, I'm not a very religious man outwardly, so this is very much out of the ordinary for me. It seemed as if Christ was helping me, sending me his love." So there you have it. It wasn't in any particular part of the astral plane, and he didn't really say anything to me. In fact, the OBE lasted just a few seconds. Jesus's presence was just too distracting to maintain my focus. Although it's very rare in the OBE literature, other people have had much "better" encounters with Jesus, where they've seen him preaching to a crowd of people, etc. My encounter was just enough to affirm to me that OBEs are not against Christianity and that people who seek to know Jesus can do so through OBEs. For the record: I think Jesus Christ is one of the most misunderstood and enigmatic figures in human history. I wish more people would use OBEs to learn more about him and other historical religious figures. Maybe the more we can learn about all our religions, the less we (as a society) will fight and kill in their names. I am a Mystical Christian and OBE Nightley. My experiences are exactly like yours but much longer and Deeper. Like you said you read a Book about Jesus so you met him. I read about Him in the Bible and other Books and Regularly meet him. What I love about you experience is that Jesus took you to God. Most Christian's don't know that Jesus takes you to God? Thanks for sharing your experience! Some Christians claim that Christ IS God. I believe this change took place right around the time people started postulating that the story of Jesus was taken from an Allegory of Astrotheology. When Christians realized there might be some truth to this, I can only imagine they changed their view to sustain their beliefs. Remember when mainstream religion touted Jesus as the Son, (sun) of God? Well, apparently this change in belief seems to be all too common when factual evidence contradicts the belief system narrative. IMPORTANT - Please watch the series titled: "MY TESTIMONIAL" after you have watched this video. This particular "Video Series" is THE work the Angel told me to do. Thank you and God Bless. The views express in the video are my own and are base on my personal experience. This is the second video of the "Truth Me Free" series. It attempts to answer the questions posted by viewers on the first video. In this second video I, Nathan Wheeler, describe what Heaven was like when I died in the Hospital on 8/2013. Upon my arrival to Heaven I was greeted by 4 very large men that I believe to have been angels. I'd like to add that they did not have wings. lol. If it has wings its a Cherubim. They (the angels) showed me around a town square and brought me to a building that resembled the Jewish Temple of the Temple Mount. The roof was flat and had gold twisted pillars with Olive leafs and olives at the top and bottom. These pillars were NOT the main pillars that held up the entrance but were on the top flat surface above the entrance as decoration. Upon my unaided-return-to-life I brought back with me a message of how great heaven is and that both God and Heaven are indeed real. I spent most of my life doubting Heaven (never God) but obviously now I do not have any doubts about either. "My encounter was just enough to affirm to me that OBEs are not against Christianity and that people who seek to know Jesus can do so through OBEs"
Yes, of course [l'm non-religious like you] and the Gnostic christians would be in full agreement - fundamentalists would call it the devil's work lol. l don't know if you've heard of the famous greek healer, Daskalos, who lived in cyprus. The book 'the Magus of Stovolos' is about his incredible life. He was apparently able to leave His body at Will from age 7 and could also visit all His past lives. There are many of his 'circles' around the world which teach these things [he calls astral projection, 'exosomatosis']. He even wrote a book about Jesus's life, because he said he was incarnated at that time and has full recall of it. l feel he's genuine IMO..
As for seeing Jesus outside the body, in most cases this will not be the Real Jesus [l don't think many see the Real Jesus]. Even in near-death experiences people don't really know what their seeing. Most ppl don't have enough occult knowledge or experience of other worlds to even know which world their in. Usually, l believe their in some Astral region and the Astral regions are full of falsehood and deception. Any being in those world's can take the form of Jesus or any other 'incarnation of God', or any other Spiritual Teacher [shapeshift or masquerade] and most of us will be taken in by them. l think what a lot of ppl see there are simply thought creations of Jesus [look how much he's worshipped - this probably accounts for most of the marian apparitions, too]. Also, there are emanations which can be from the True Jesus - but a lot of discrimination and Higher guidance is needed before we can say it's Jesus or Heaven. There many heavens over there, not just one christian version of it. What religious types experience as their heaven, is what some OBE'ers call a 'consensus reality' created by a mass of believer's - not the real astral environment.. Ever wanted to get free Twitter Re-tweets? Did you know you can get these ON AUTOPILOT & TOTALLY FREE by getting an account on Like 4 Like? is the earth a flat disk once you astral project? .. ( I don' t believe in nasa )!